Hand carved wooden fish relief created without the use of patterns. 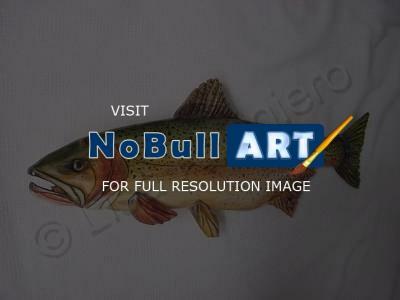 The trout is also part of the Living Waters Series of Realistic wooden fish. Painted in watercolors with pearl acrylics added for an iridescent look, which allows the natural knots and wood grain to show through. Sealed in 7 coats of a high grade, high gloss marine varnish. This will protect the colors against damage or fading over time. Measuring 26 inches in length, 10 inches wide and has a glass realistic trout eye. There is a wire hanger located on the back for easy hanging on any wall. Signed, dated, numbered along with the name by wood burning on the backside. Comes with a certificate of authenticity that this is an original piece from DryRiver Carvings.